Vicky park was well busy this arvo. A grom commented "its going to be world war three" as a fat skater over on the shallow end of the bowl section yells "get out of the bowl!" to Bmx riders dropping in to the deep end as fellow skaters in the shallow bowl carve out to shred the whole area. Seems there is a bit of chaos as everyone is keen to ride the new park. 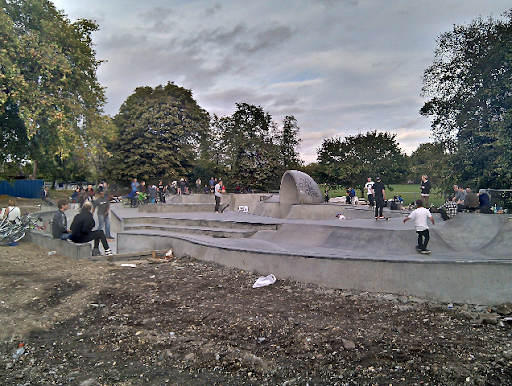 London skateparks do get very busy with all types of people and skill levels. From what I have seen the crowds and pros are usually tolerant and let anyone have a go. I expect the park to have a few months of new park crazyness. This should mellow out as novelty and spectical of the park becomes the norm and everyone chills out a bit. Still not officially opened or finished we have more crazyness to come no doubt.